Moving into the 21st century requires moving through the 19th and 20th century. An interesting artist of that era who produced both etchings and lithographs is Marc Chagall. There is a wonderful digitized collection of his work at the Spaightwood Galleries. 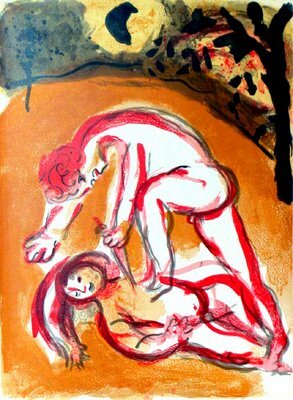 There you can find an exhibition of his work entitled "Marc Chagall and the Bible: Etchings and Lithographs from 1930 to 1980." Read a little more about his background. It is very interesting. 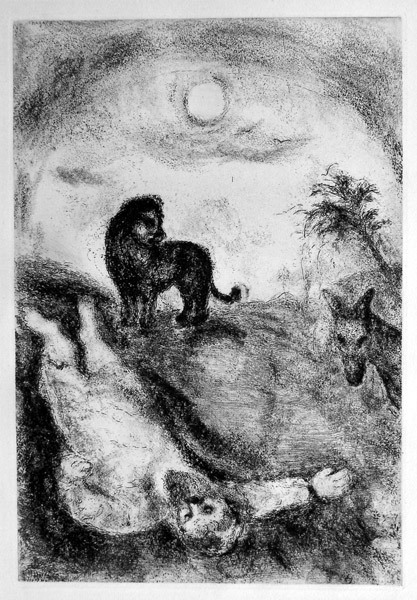 Disobedient Prophet killed by a Lion (1 Kings 13:23-25) (H. 357, S. 282). Original etching, 1931-1939; completed 1952-1956. This picture is from the "Bible Etchings 3" collection. Cain and Abel (Gen 4) (M. 238). Original color lithograph, 1960. This picture is from the "1960 Bible Lithographs 2" Collection.